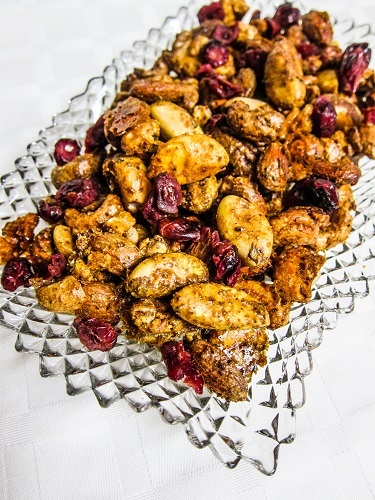 I like to serve lots of snacks on New Years Eve, and one of my favorites is spiced nuts. They are not only easy to make, but everyone seems to love them and they taste so good! The recipe I am sharing with you today features nuts with fragrant curry powder, they are a little salty, a little sweet, and the curry makes them a lovely golden color. These are gluten free, dairy free and vegan too! If you would like something similar that was nut free, you could swap the nuts for a mixture of pumpkin seeds, sunflower seeds, and sesame seeds, and that would be delicious as well! Preheat the oven to 375F degrees, and line a sheet pan with parchment paper. Toss the nuts with the maple syrup, maple sugar, spices and sea salt in a bowl, then spread out on the prepared baking sheet. Place in the oven and roast until the nuts are starting to brown and are fragrant. Add the cranberries, and serve!